Domestically, movies in 2015 brought in $11.1 billion at the box office. The top grossing film was “Star Wars: The Force Awakens,” which made $936.7 million domestically and $2.068 billion worldwide. The music industry pulled in $7.02 billion in the US in 2015, according to the New York Times. Sales have hovered around the $7 billion mark since 2010. In 2006, CD sales were $9.4 billion; they’re now at $1.5 billion, a drop of 84%. Book sales for 2015 totaled $27.78 billion, down slightly from the previous year. I’d assume a small fraction of that includes graphic novels and trade paperbacks. This total includes ebook and audiobook sales. Sales of video games in 2015 pulled in $16.5 billion. That’s gone up over the past several years, though not at video game sales’ 2010 high of $17.1 billion. Newspapers pulled in $37.6 billion in 2013, the last year exact figures are available. The Newspaper Association of America has apparently stopped releasing figures, which might say something about the state of the newspaper industry. 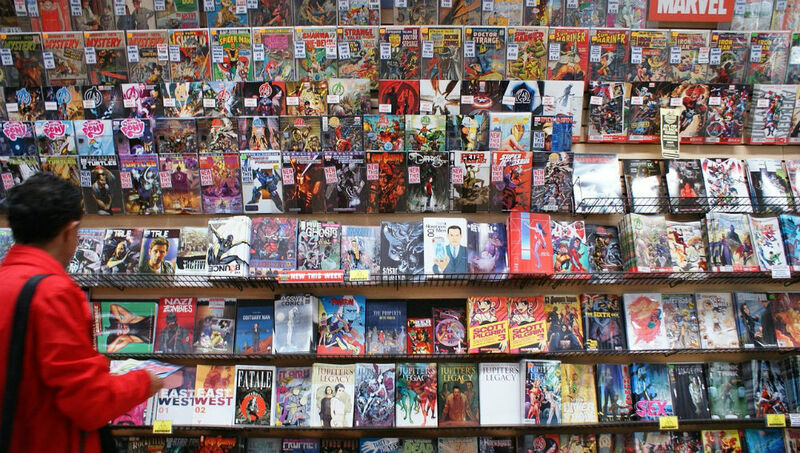 It’s not a surprise that comics come in at a fraction of other types of media. There’s a reason that the “Big Two,” DC and Marvel, put a big emphasis on turning their comic book properties into video games, movies, and other merchandise. The revenue from those alone can easily eclipse, and make up for, comics’ comparatively smaller sales. For example, “Captain America: Civil War” pulled in $406.9 million domestically alone, and $1.151 billion globally. Granted, DC and Marvel’s comic divisions are also treated by their owners (Time Warner and Disney respectively) as intellectual property farms. The growth in non-Big Two comic sales, of course, is a good thing. It’s a positive sign for independent and smaller press creators, who have a lot at stake fiscally and creatively in a stronger comics industry. Wow. Thank you for this comparison. Whenever people say “XYZ industry makes x-billion”, I never know just how big or small that is. I’m impressed by the comic book revenue compared to other media. Comics make nearly 10% of movies!? Movies always seemed to be such a large industry. But compared to books (or even, newspapers?! ), movies don’t seem to make that much. Rather amusing on the CD point. People are still buying CDs? It would be fun to be a Best Buy cashier for a week, just to see who buys CDs. I say a week instead of a day, because it might take that long until someone purchases a CD! Another industry stat: Kickstarter has raised $2.5bn since it’s start. Although it’s a bit apples to oranges, because that’s not a stat from just 2015, but Kickstarter’s entire life since 2009. I’d love to see the amount Kickstarter has raised in 2015.